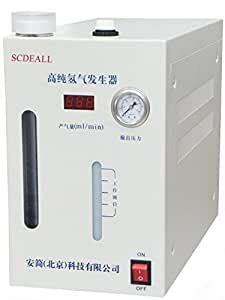 Product feature 1ãThis high purity hydrogen generator is a new type product developed on the foundation of the technology of astronautic fuel cells. 2ãThe working principle of hydrogen generator is, hydrogen is produced by the electrolysis of water, and the produced oxygen is released to the atmosphere. 3ãIt is made up of these systems such as the electrolyzing &separating pool, switch power, pressure controller, desiccation& purification and flow display. 4ãThe core part of the instruments is electrolyzing &separating pool, in which the positive pole is of tube type structure, the negative pole is of sheet metal shape, and both the poles are made of stainless steel. 5ãThe electrolyzing &separating pools can store electrolyte, produce hydrogen as well as release hydrogen at the same time, and it is the best replacement to sheet shaped electrolyzing pools. 1ãThis high purity hydrogen generator is a new type product developed on the foundation of the technology of astronautic fuel cells. 2ãThe working principle of hydrogen generator is, hydrogen is produced by the electrolysis of water, and the produced oxygen is released to the atmosphere. 3ãIt is made up of these systems such as the electrolyzing &separating pool, switch power, pressure controller, desiccation& purification and flow display. 4ãThe core part of the instruments is electrolyzing &separating pool, in which the positive pole is of tube type structure, the negative pole is of sheet metal shape, and both the poles are made of stainless steel.